When was the birth of the Messiah? Was He born on the 25th of December, or on a significant day in the Creator’s calendar? We will find the answer to these questions in this chapter of the Book the Reckoning of Time. Therefore Yehovah Himself gives you a sign: Look, the maiden conceives and gives birth to a Son, and shall call His Name Immanuel. A woman clothed with the sun, with the moon under her feet” … being with child, screamed, travailing in birth and agonized to be delivered. This graphic is from www.TorahCalendar.com, under the menu item: Determining the Hebrew Month selected to display the New Moon Day for Month 7 of the year 3 B.C.E. 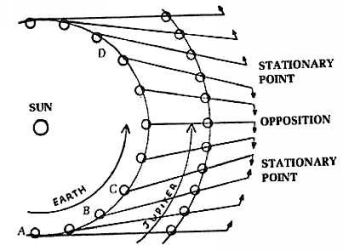 The diagram shows the horizon at the moment of sunset at Jerusalem. The disc of the sun is shown just below the western horizon. … and refers to the actual moment between sunset at 5:53 p.m.. and moonset at 6:35 p.m. on the first day of the seventh month, September 11, 3 BC. The best time to sight the first crescent of the moon on that day was at 6:12 p.m., and this is the minute the Messiah might have been born according to some: 6:12 p.m. as the brightest star in Bethulah or Virgo (Tsemech in Hebrew, Lat. Spica, an ear of corn – a kernel of wheat) touched the horizon, or “alighted to the earth.” (Robert Wadsworth, Biblical Astronomy). This is significant because the Messiah compared Himself to a kernel of wheat in Joh_12:23-26 concerning His death. The death of the Messiah at Passover is to bear much fruit by bringing eternal life to all who believe and obey Him. The Hebrew name – Tsemech – was referred to by the prophets of Israel centuries before the Messiah was born (Jer_23:5-6, Zec_3:7-8, Zec_6:12-13, Zec_9:9-10). Many ancient sages saw in the Scriptures that the coming of the Messianic King, to establish his kingdom, would be preceded by a time of immense suffering. The sign of Rev_12:1 is a sign that occurred when Messiah was born and is also a sign that will occur at the beginning of Ya’akov’s Trouble and goes along with the figure of speech used for this time in Rev_12:2. This sign now occurs on Yom Teruah whenever Yom Teruah falls in late September to early October and is seen from Yerushalayim about every three years or so. See also Appendix E: Signs of the Messiah. However, the heavens declare even more than this. For at the very moment the Branch (the Messiah) was coming to the earth, and Yerach (the moon) was reflecting the light of Shemesh (the sun) above the horizon, the planet Tzedeq (Jupiter) was very close in conjunction with the brightest star of the constellation Leo below the horizon. Tzedeq is the same word that appears in Melchizedek which means “King of Righteousness” and refers to the Messiah. Tzedeq is the planet of the Messiah. Leo (Lion) is the constellation of Yehudah from which the Lion of Yehudah – the Messiah – comes. The brightest star in Leo is Regulus (King) which is the King star. Tzedeq near Regulus in Leo signaled the birth of Messiah the King – the Lion of Yehudah. Without any doubt, the magi who were in Mesopotamia in September 11, 3 BC would have witnessed this celestial phenomenon appearing on the western horizon towards the land of Yehudah. These magi, who we have the reason to believe were scholars of the scholars of Daniel the prophet (remember Daniel had been elevated to the position of chief of all astrologers of the empire), had taken this sign in the sky as the birth of the long awaited Messiah of Israel. Being magi of the empire, they might have been aware of Daniel’s prophecy (Dan_9:24-27) about the Jewish Messiah and why not of Isaiah’s prophecy regarding His birth. The magi might have been eagerly waiting for this event for centuries. And when they received this sign, they prepared themselves for the long journey and headed towards west. They arrived in Yerushalayim sometime after Yeshua’s birth (Mat 2:2), but when exactly? The widespread teaching is that three magi came to the stable (in Bethlehem) and presented their three gifts to the newborn baby. However, is this what the text of Matthew says? No, it does not. When the magi observed the celestial event of the birth of Daniel’s Messiah in September 11, 3 BC, most likely they needed time to prepare for the long and difficult journey to Yehudah. There was no reason for them to be in a hurry for the Messiah had already been born. Collecting money for the expensive gifts and for the trip, we can expect, required time. And indeed, they needed to provide proper security for their trip given the expensive gifts of gold, frankincense, and myrrh, which they took with them, hence the need for guards. Having said all that, we may deduce that it took them a considerable amount of time to organize their journey and we may say that it was a caravan of magi, servants, and some troops and not only three magi who travelled all the way from the east to the land of Yehudah. And see, the star which they (the magi) had seen in the East went before them, until it came and stood over where the child was. And seeing the star, they rejoiced with exceedingly great joy. And coming into the house, they saw the child with Miryam His mother, and fell down and did reverence to Him, and opening their treasures, they presented to Him gifts of gold, and frankincense, and myrrh. By the magi’s arrival in about a year, the family must have moved to their home town of Nazareth, where the magi met Yeshua. There is no indication anywhere in the text that the magi went to Bethlehem. Notice that the text says where the child was, not where the child was born. The confusion among millions of believers today that they went to meet baby Yeshua in Bethlehem comes from Herod himself who asked the chief priests where the Messiah was to be born and they answered (Mat 2:4-5), “In Bethlehem of Yehudah, for this has been written by the prophet” (Mic_5:2). Hence, Herod sent the magi to Bethlehem to search for the child but nowhere in the text it is said that they indeed went to Bethlehem but they must have gone to where Yeshua actually was: in Nazareth. Then Herod, having seen that he was fooled by the magi, in his madness he sent forth and slew all the male children in Bethlehem, from two years old and under, according to the time which he had exactly learned from the magi (Mat 2:16). This record comes to show that Yeshua must have been between one and two years old. Eusebius, in his Early Church History, Vol 1, Ch. 8, states the same by saying that the murdered infants were of his (Yeshua) own age, therefore, Yeshua must have been between one and two years old. Insert: Herod was the Jewish proxy ruler of the Land under imperial Roman occupation from 37 BC and reigned for more than six decades. Herod was born in 73 BC. His mother was an ethnic Arab, and his father was an Edomite. He was a descendant of those Edomites who were forcibly converted to Judaism. Many of his subjects considered Herod an outsider—a “half Jew,” as his early biographer, Flavius Josephus later wrote. Historians do agree that toward the end of his reign, Herod slaughtered many political rivals, among them one of his ten wives and three of his sons. Josephus wrote that as the elderly Herod lay riddled with disease, he ordered the local Jewish aristocracy to be executed on his death, so that his passing would bring widespread mourning, and not celebration. Let us go back to Mat 2:9: the star which they had seen in the East went before them, until it came and stood over where the child was. This passage has brought a great deal of speculations and there is no lack of theories as to what that star that stood over might have been. Some have even concluded that that must have been a fiction. Remember, this is about a year or more after the birth of Yeshua. If His birth was in 3 BC, the star that was leading the magi to the Messiah must have appeared sometime in 2 BC. We already saw that at the very moment the Messiah came to the earth the planet Tzedeq (Jupiter) was very close in conjunction with the brightest star of the constellation Leo. The Messiah’s planet was to play one more role in the heavenly orchestra. That star was Jupiter. This is what happened when Tzedeq (Jupiter) was leading the magi from east to west and became “stationary” over Yeshua at its times for retrogression and progression which might have taken place at the time of Hanukkah in 2 BC. And the Word became flesh and pitched His tent among us, and we saw His esteem, esteem as of an only brought-forth of the father, complete in favour and truth. If Yeshua was born at Sukkot, 3 BC, and if we count backwards nine months, it appears that He was conceived sometime during Hanukkah, December 4 BC. While the Second Temple was dedicated on Sukkot, the foundation was laid the day before the first day of Hanukkah (Hag_2:18). So, His body was dedicated (born) at Sukkot and thus the foundation (conception) was laid around Hanukkah. As already said, there is a good possibility that Yeshua could have been born on Yom Teruah, on the first day of the seventh month, September 11, 3 BC, as clearly the sign of the sky indicated the comming of the Messiah. However, whether Yeshua was born on Yom Teruah or Sukkot, we do not know with a hundred percent certainty. The opinion of this author is that the sign of His birth given in heavens on Yom Teruah could have been a harbinger of His comming birth, which the magis saw, but the actual birth was on the first of day of Sukkot, fifteen days later. And when eight days were completed for Him to be circumcised, His name was called Yeshua, the name given by the messenger before He was conceived in the womb (Luk_2:21). That eighth day could have been the eighth day after Sukkot which by tradition is called Simchat Torah, meaning “Rejoice in Torah.” And indeed, what would be the greatest rejoice in Torah but the fulfilling of the prophecy in Torah about the coming of the Prophet like Mosheh; the glory of YHVH whom Avraham and Mosheh had been made to foresee in the future. This celestial sign now occurs on Yom Teruah whenever Yom Teruah falls in late September to early October and is seen from Yerushalayim about every three years or so. Insert: The eighth day after the first day of Sukkot is a day of rest called in the Torah “Shemini Atzeret”. This holiday is widely known today by the Rabbinic name “Simchat Torah” which refers to the annual reading of the Torah in weekly portions which ends on Shemini Atzeret. Neither the annual reading of the Torah nor the name Simchat Torah appear in the Bible and these are later Rabbinic additions. Shemini Atzeret is not part of Sukkot and the laws of Sukkot do not extend to this day, i.e. Pilgrimage, dwelling in a booth. It is a closing fastival of all appointed times of YHVH starting with Rosh HaShanah and Passover, and ending with Sukkot (Lev 23:36). This eclipse is believed by many to happen at the death of Herod in March 13, 4 BC. If this is true, then the birth of the Messiah cannot be 3 BC. According to others, however, this eclipse was only partial (40 percent total) and fairly hard to detect. The events narrated by Josephus to have occurred between this eclipse and the Passover that followed are impossible to fit in, if one takes the 4 BC date. The total eclipse of January 9-10, 1 B.C., however, eliminates these problems. One needs to know that lunar eclipses happen only when there is a full moon. That eclipse —according to John Pratt—was listed as total for 51 minutes near midnight and centered over 15 degrees east longitude, which is perfect for having been viewed in Yerushalayim. Many certainly would have noticed this eclipse. This blood red moon might have represented the innocent blood that was spilt shortly before this (within a few weeks) by Herod when he ordered all the children two years old and under to be slaughtered in Bethlehem. And also the killing of the two rabbis that evening. Mary conceived Yeshua in December 4 B.C. (Hanukkah) Yeshua was born on September 11, 3 B.C. (Day of Trumpets) Magi came and found the young child Yeshua in a house on December 25, 2 B.C. (Hanukkah) and two years from when Yeshua was conceived. Yeshua was 1 year and 3 months old at this time and in his second year after he came out of the womb. Magi were warned by an angel to return to their country by a different route and Joseph also warned to flee to Egypt with Mary and the child. Herod became gravely ill shortly after the eclipse that occurred on January 10, 1 B.C. (16 days after the Magi came to see Yeshua). Most likely as punishment for slaying all the children in Bethlehem and also to protect Yeshua. Herod died on January 28th (Schebat 2) in 1 B.C. Angel told Joseph that Herod had died and that he could take his family back to Israel. This most likely took place at least one month after Joseph and his family escaped to Egypt. Whether, Herod’s death was in January 10 or January 28 in 1 BC does not make a significant difference: the death of Herod places the birth of the Messiah at least two years prior especially when considering his stay in Egypt (Mat_2:16; Mat_2:19-23). Therefore, Yeshua was born in 3 BC and Herod died in 1 BC. There is a widespread tradition in the world that Yeshua was born on December 25th. While it is not in the scope of this study to expose the influence of paganism in Christianity, it suffices to say that there is evidence from the Scripture that the birth of the Messiah was in autumn, not winter. And the evidence is this. Zechariah the father of Yochanan was a priest of the division of Aviyah. During the reign of King David the priests became too numerous to all serve at the Temple all the time, so they were divided by the king with Tsadok of the sons of Elʽazar, and Ahimelek of the sons of Ithamar by lot into twenty-four divisions (the sons of Elʽazar into sixteen and the sons of Ithamar into eight divisions (1Ch_24:1-4) because there were more leaders found of the sons of Elʽazar than of the sons of Ithamar. Antiq. 7:14:7. But David, being desirous of ordaining his son king of all the people, called together their rulers to Yerushalayim, with the priests and the Levites; and having first numbered the Levites, he found them to be thirty-eight thousand, from thirty years old to fifty; out of which he appointed twenty-three thousand to take care of the building of the temple, and out of the same, six thousand to be judges of the people and scribes, four thousand for porters to the house of God, and as many for singers, to sing to the instruments which David had prepared, as we have said already. He divided them also into courses: and when he had separated the priests from them, he found of these priests twenty-four courses, sixteen of the house of Eleazar, and eight of that of Ithamar; and he ordained that one course should minister to God eight days, from Sabbath to Sabbath. And thus were the courses distributed by lot, in the presence of David, and Zadok and Abiathar the high priests, and of all the rulers; and that course which came up first was written down as the first, and accordingly the second, and so on to the twenty-fourth; and this partition hath remained to this day. He also made twenty-four parts of the tribe of Levi; and when they cast lots, they came up in the same manner for their courses of eight days. He also honored the posterity of Mosheh, and made them the keepers of the treasures of God, and of the donations which the kings dedicated. He also ordained that all the tribe of Levi, as well as the priests, should serve God night and day, as Mosheh had enjoined them. Each division served for two weeks each year, once in the first half of the year and once in the second half of the year. There were also three weeks in which all the priests were required to serve, these were the three pilgrimage festivals (Deu_16:16). This makes 24 divisions x 2 weeks = 48 weeks + 3 weeks = 51 weeks. 51 weeks are 357 days fitting within the 360 day lunar year. The division of Aviyah was the eighth division (1Ch_24:7-19) which serves the tenth week during the former rain portion of the year (this is because during Passover and Shavuot all the priests serve together). Zechariah the father of Yochanan had this vision while serving in the course of Aviyah in the tenth week and it will become apparent that he was serving his first course in the first half of the year not his second. Thus Zechariah’s vision took place during the 10th week of the year. We must add two additional weeks before Yochanan could be conceived, due to the purity laws of Lev_12:5 and Lev_15:19-25. So Yochanan was conceived in the 12th week of the year. He was born about 40 weeks later during the 52nd week of the year (12 + 40 = 52) which brings us to Passover. Thus Yochanan was born at Passover, the very time that Eliyahu was, according to Jewish tradition, supposed to appear. That is why he was asked whether he was Eliyahu. Yeshua was conceived six months (about 25 weeks) after Yochanan’s conception. This means Yeshua was conceived around the 37th week, around Hanukkah. This would mean the Light of the world was conceived during the festival of lights. Yeshua was born 40 weeks later (around week 77 that is week 25 of the following year) this brings us to the time of the fall feasts. If the birth of the Messiah were on December 25th that would place the birth very close to the festival of Hanukkah. Notice that Joh_10:22 explicitly says that “and it (Hanukkah) was in the winter.” Why would the narrator even mention the actual season of Hanukkah? Because Hanukkah falls in winter. In contrast, in the narratives of the birth of the Messiah there is no such a description because there was no winter at that time. If Yeshua were born in winter, what would be more natural for the narrator to say that baby Yeshua, the Light of the world, was born in a manger in a cold winter a few days after Hanukkah, the Festival of Lights? Thus connecting the birth of the Messiah with the Festival of Lights. However, the apostle has made no mention of Hanukkah. The reason being is that because Yeshua was not born in the winter, but on Sukkot, which festival is also called and celebrated as the Festival of Lights (2Ma_10:5-8), in the warm autumn. The entire city of Yerushalayim was filled with light during the feast of Sukkot from giant seventy-five feet tall menorahs (m.Sukkah 5:2–4; b.Sukkah 52b). And furthermore, Yoseph would not have departed for Egypt until after February 4th when the required forty plus days for Miryam’s purification had been completed and they had made their sin and burnt offerings (Luk_2:21-24). 1. Bethlehem, which was about five miles away, was crowded due to the pilgrimage for Sukkot when Yehudim were required to come to Yerushalayim (Deu_16:16); this would not have been due to the census which would have taken place over the period of a year. 2. The Hebrew word for “stable” is “sukkah” (as in Gen_33:17) so it is likely that Yeshua was born in a Sukkah/booth. 4. Sheep do not mate in winter (Luk_2:8) but in autumn. It would have been unnatural for the shepherds to live with the sheep out in the field (consider Ezr_10:9, Ezr_10:13; the people were trembling due to the cold rain in the ninth month, December in the Gregorian calendar, also Jer_36:22) and impossible for the sheep to mate during the midwinter of December 25. One can bring the sheep out at the freezing temperatures, but they will not mate anyway. Consider this in Gen_31:40, “By day the heat consumed me, and the frost by night, and my sleep fled from my eyes.” Ya’akov complained against his evil uncle, because Lavan made him do what no one else would have made him do referring to the cold nights, therefore, it proves that it was not the custom for shepherds to tend their flocks in the fields by night in winter. Day 1, seventh month, 3962. 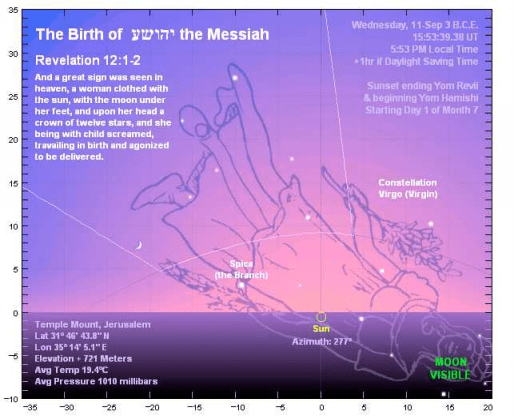 On Yom Teruah a sign of the sky was given of the coming birth of the Messiah. Day 15. On the first day of Sukkot, Yeshua the Light of the world was born in Bethlehem. The following seven days were for celebration of Sukkot (Lev_23:34). His mother Miryam was in her seven-day separation due to the birth of male offspring, according to Torah (Lev_12:2). Day 22. On the eight day after Sukkot, was a day of rest called in the Torah “Shemini Atzeret” known today as “Simchat Torah” (Rejoice in the Torah). On this day Yeshua, the living Torah, was circumcised according to Torah on the eighth day (Lev_12:3). Day 23. Sometime after Shemini Atzeret and after Yoseph and Miriam paid their taxes to Rome, they return to Nazareth where Miryam remained in the blood of her cleansing thirty-three days (Lev_12:4). Day 25, eighth month, 3962. After the cleansing according to Torah was completed, Miryam brought two turtledoves as a sin korban into the Temple (Lev_12:8). This was what Yoseph and Miryam offered on the altar because they were poor and could not bring a lamb a year old, as a burnt offering, and a young pigeon or a turtledove according to Lev_12:6. And sometime after that, in 3964, Yeshua was taken to Egypt to escape the massacre of innocent infants and returned to Yehudah after Herod’s death same year. We may ask the question: how could the family afford to make the long and expensive trip to Egypt given they offered only two turtledoves? The answer is simple as it is: the provision was made by the magi’s gifts. It is worth noticing here that the common used “BC/AD” reckoning was artificially created to count the years before and after the Messiah by the adoption of the birth of Yeshua as the initial epoch of the Christian calendar. This epoch was established by the sixth-century scholar Dionysius Exiguus, who was compiling a table of dates of Easter for the pope in 525 AD. An existing table covered the nineteen-year period denoted 228-247, where years were counted from the beginning of the reign of the Roman emperor Diocletian. Dionysius continued the table for a nineteen-year period, which he designated Anno Domini Nostri Jesu Christi 532-550. Thus, Dionysius’ Anno Domini 532 is equivalent to Anno Diocletian 248. In this way a correspondence was established between the new Christian Era and an existing system associated with historical records. What Dionysius did not do was establishing an accurate date for the birth of Messiah. He reckoned that the incarnation of Messiah had occurred on March 25 in the year 754 a.u.c. [ab urbe condita, “from the founding of the city” (of Rome)], with his birth occurring nine months later. Thus the year 754 a.u.c. was designated by him as the year 1 AD with the birth of Yeshua occurring nine months later on December 25th. According to some accounts, he dated the events from the birth of Yeshua making a major error calculating the birth four years after the death of King Herod. According to other accounts, however, he did not make any error but correctly pinpointed the Messiah’s birth in 1 AD. The Julian and later the Gregorian calendars which are based on the Egyptian calendar use the solar year of 365.2422 days while the Creator’s calendar uses the lunar year of 360 days.